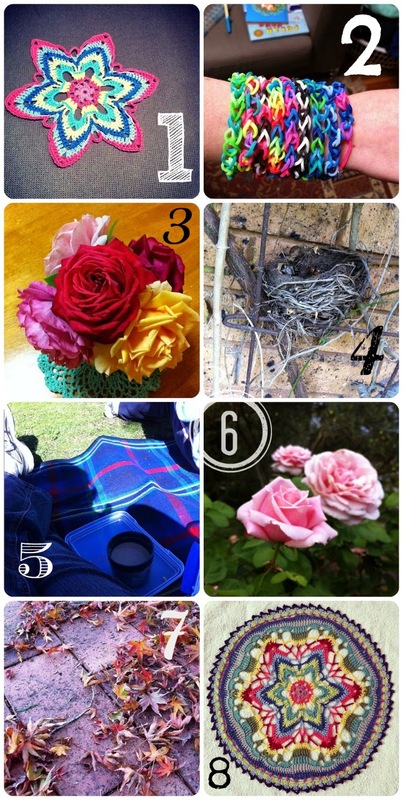 A peek into my week via a selection of pictures from my Instagram feed. This week the leaves really started to fall, they shower down from the trees with every gust of wind, colourful and delicately dancing down to the ground. My Summer clothes went into storage and my long sleeves came out into the wardrobe. 4. I've been pruning a crazy overgrown section & unearthed 5 abandoned nests within in. Amazing workmanship. 5. Ahhh. Enjoying a Cuppa with my picnic lunch while the kids played at the discovery Playground, Tidbinbilla. 6. I a really loving this rose right now. It has never captured my attention and admiration in such depth before. 7. One of my favourite Autumn sights the beautiful colours of the falling leaves. 8. My Mandala completed. I hope to show you what I have done with it during the week.